4454 Referee is a Soccer/Football set released in 2002. 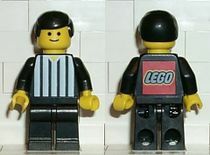 The set contained a referee minifigure holding red and yellow cards. The set was part of a Japanese promotion by Coca-Cola for the 2002 World Cup. The Referee has a black leg piece, black arms with yellow hands, and a black torso printed with vertical white stripes on the front. The back is printed with a LEGO logo. He has a simple plain black hair piece, and a simple smiling face. He carries two accessories, two 1x1 tiles, one in red and the other in yellow, representing a football referee's red and yellow cards. The referee is the individual responsible for enforcing the rules during a match, and has the ability to award free kicks, or issue players with yellow or red cards. This page was last edited on 9 February 2019, at 18:44.